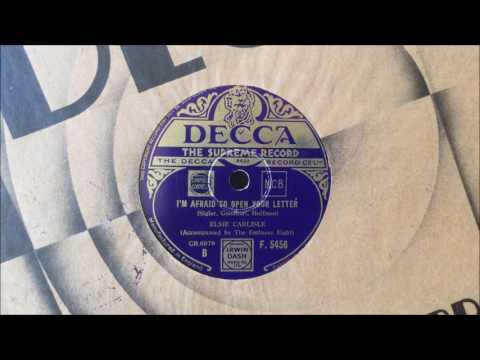 “I’m Afraid to Open Your Letter.” Words and music by Maurice Sigler, Al Goodhart, and Al Hoffman (1935). Recorded by Elsie Carlisle, accompanied by The Embassy Rhythm Eight, in London on February 15, 1935. Decca F. 5456 mx. GB6979-1. Like the song on the reverse side of the record (“I’ve Got an Invitation to a Dance”), “I’m Afraid to Open Your Letter” is about a woman receiving a piece of mail and then deliberating, hesitating, and agonizing. In the case of this song, however, the conceit is even simpler, for as the song’s title and the singer repeatedly tell us, she does not open the letter that she has received from her lover, fearing that it is a breakup letter. She tells us nothing about her relationship or her reasons for expecting its dissolution. Lyrics of such a basic and uncomplicated nature could prove a challenge for any singer; it is hard to repeat the same idea again and again, using virtually the same words, and still to seem sincere. Elsie Carlisle pulls it off, relying both on the inherent sweetness of her voice and on her uncanny ability to evoke with a quavering voice the idea of a weepy girl. As is so often the case, Elsie’s success in evoking sympathy is rooted in her being not just a singer but a vocal actress. 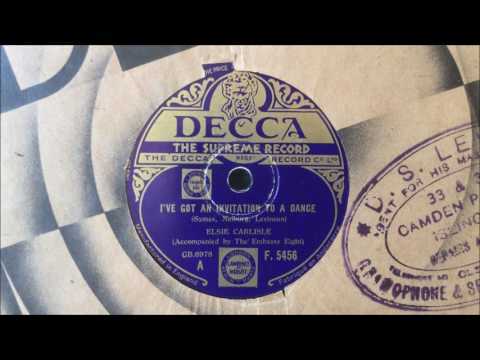 It is rare for two songs so closely united in subject matter and tone as “I’m Afraid to Open Your Letter” and “I’ve Got an Invitation to a Dance” to end up on either side of a 78 rpm record. For the most part, the pairing of songs on a record seems entirely serendipitous. On both sides Elsie’s elegant interpretation of simple lyrics is complemented nicely by the playing of The Embassy Rhythm Eight, a studio recording band consisting of members of the Ambrose Orchestra. 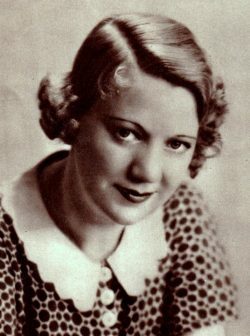 “I’m Afraid to Open Your Letter” was written by three composers well-represented in Elsie Carlisle’s songbook. Maurice Sigler was a collaborator on “Little Man, You’ve Had a Busy Day”; Al Goodhart co-wrote “Fit as a Fiddle” and “Who Walks In When I Walk Out?”; Al Hoffman contributed to all three songs, as well as to “My Darling”; and all three men collaborated on “Rehearsing a Lullaby,” which Elsie would record later in 1935. “I’m Afraid to Open Your Letter” was recorded in America in 1935 by Don Bestor and His Orchestra. In Britain recordings were made by the Casani Club Orchestra (under the direction of Charlie Kunz, with vocals by George Barclay), Teddy Joyce and His Dance Music (with vocals by the Four Smith Brothers), Phyllis Robins, Ann Summers, and Primo Scala’s Accordion Band (in a medley). “I’ve Got an Invitation to a Dance.” Words and music by Marty Symes, Al J. Neiburg, and Jerry Levinson (1934). Recorded by Elsie Carlisle with the Embassy [Rhythm] Eight in London on February 15, 1935. Decca F. 5456 mx. GB6978-1. Elsie imbues the argument of “I’ve Got an Invitation to a Dance” with poignancy while developing a vocal persona strong enough to make up for the vagueness of the lyrics. We do not know, for example, whom the woman blames for the breakup or any of its circumstances. Elsie seems to deliberate over each syllable to reveal what we do know about her character’s motivations, namely her desire to be reunited with her lover. The melancholy atmosphere is enhanced by the elegant but subdued playing of The Embassy Rhythm Eight (mentioned on the label simply as The Embassy Eight), a studio recording band made up of core members of the Ambrose Orchestra. I should note that on this record (unlike the one with “Whisper Sweet” and “Dancing with My Shadow,” songs for which The Embassy Rhythm Eight almost certainly played the accompaniment), both Elsie Carlisle and the band are credited on the label — a very rare occurrence. Elsie’s records are almost perfectly divided into groups that mention her name and not the band, or that mention the band and not her. Perhaps the Embassy Rhythm Eight, which had been recently formed, wanted the extra publicity. “I’ve Got an Invitation to a Dance” was recorded in America in 1934 by the Casa Loma Orchestra (with vocalist Kenny Sargent), Hal Kemp and His Orchestra, Paul Pendarvis and His Orchestra (with vocals by Eddie Scope), the Will Osborne Orchestra (with vocals by Will Osborne), Ruth Etting, and A. Ferdinando and His Orchestra. British versions of “I’ve Got an Invitation to a Dance” were made in 1935 by Roy Fox and His Band (with vocalist Denny Dennis), Billy Cotton and His Band (with vocals by Harold “Chips” Chippendall), Jay Wilbur and His Band (with singer Cyril Grantham), the New Grosvenor House Band (under director Sydney Lipton, with vocalist Gerry Fitzgerald), Lou Preager and His Romano’s Restaurant Dance Orchestra (with vocal refrain by Pat Hyde), and Scott Wood and His Orchestra (in a medley).